Guess who’s learning Arabic? 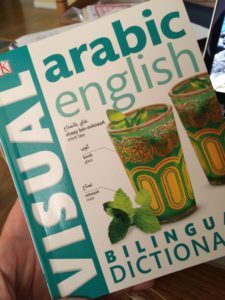 Since our Syrian refugee family arrived in Canada at the end of February, it’s been frustrating to have to communicate through an interpreter, so a few weeks ago, three of us hired an Arabic speaker to teach us. Although we’re also learning how to write Arabic, the most useful communication for me is conversation. The first time I tried out a few of my new words with the family, they were surprised and delighted. Since then, I regularly intersperse English conversation with phrases I’ve learned. Sometimes they laugh; sometimes they correct me, but I know they appreciate my efforts. After all, they’re struggling to learn a new language too. I’ve always been a literacy advocate. As a teacher and principal, I promoted literacy in my classes and schools. When I was working, I volunteered as a Literacy Tutor one night a week with an adult student. I even adapted the primary school technique of ‘Running Records’ and ran workshops for various Literacy Councils in using this tool to assess adult reading levels. In several schools where I was an administrator, there was a high Chinese population, mainly from Hong Kong. In order to make these families feel welcome, I took conversational Cantonese courses. I can tell you Arabic is a lot easier than Cantonese! Wish me luck with this latest endeavour.